"It's okay to feel a little crazy… But it's not fair to you to have to do it all by yourself." Strand Releasing has debuted a trailer for the film Lovesong, an indie drama that premiered at the 2016 Sundance Film Festival last year. 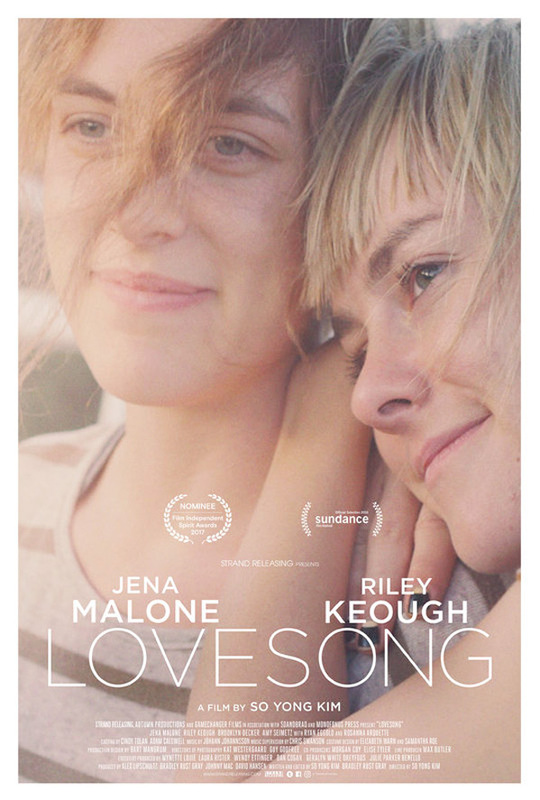 Lovesong is the latest film from Korean-American director So-yong Kim, starring Riley Keough and Jena Malone as two close friends who end up getting even closer when they go on a roadtrip together just before one of them is getting married. The cast includes Brooklyn Decker, fellow filmmaker Cary Fukunaga, Juliet Fitzpatrick, Neal Huff, Ryan Eggold, Marshall Chapman & Amy Seimetz. This trailer has a nice feel to it, and this seems like it might be worth catching for these two lead performances. Neglected by her husband, Sarah (Keough) embarks on an impromptu road trip with her young daughter and her best friend, Mindy (Malone). Along the way, the dynamic between the two friends intensifies before circumstances force them apart. Years later, Sarah attempts to rebuild their intimate connection in the days before Mindy’s wedding. Lovesong is directed by Korean-American filmmaker So-yong Kim, of the films For Ellen, Treeless Mountain, In Between Days previously, as well as a few shorts and TV work. The screenplay is by So-yong Kim and Bradley Rust Gray. The film is premiering at the 2016 Sundance Film Festival a year ago. Strand will be releasing Lovesong in select theaters starting February 17th this winter. Seems selfish to just leave your kid like that, but I know it is common nowadays. Finally! A movie about two girls who are not kissing each other. Performances and story seem interesting, but the trailer felt somewhat pretentious and artsy for the sake of being artsy. This style of filmmaking is not for me.